There are spaces in our cities that don't exist. These are the places that planners never expected, nor wanted, anybody to go, nor provided any facilities for them to be reached. They have no function except to give shape to the road junctions that flow around them. They are the bleak, dirty, litter-strewn concrete island pavements that the major road planning of the late twentieth century made so familiar to us: the centres of roundabouts, the places under flyovers. But one of these non-existent places took on a remarkable life on Friday evening. 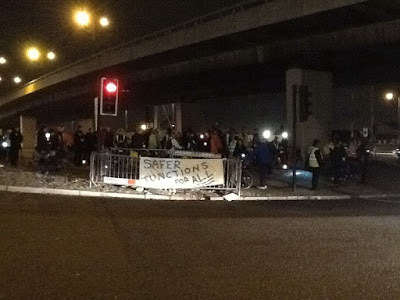 In the centre of Bow roundabout, in east London, people gathered to remember the two cyclists killed trying to negotiate that junction, on Boris Johnson's tragically mis-conceived Cycle Superhighway 2. Those people each personally had to take calculated risks even to reach that gathering point. There are no pedestrian crossings; the only way to the centre is to wait for the lights to go red and dash across at the white line, one stage at a time, from one bleak island non-place to the next. To cross when the lights are red, but when you have not seen them just go red, would be very foolish, for they can change again in an instant, and the traffic would be on top of you. 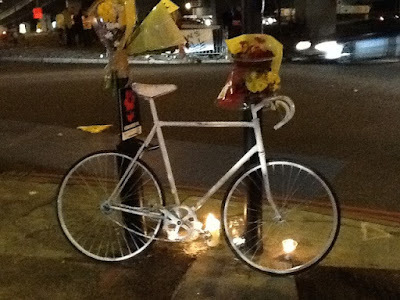 The dead cyclists were Brian Dorling, hit by a left-turning lorry while cycling east on 24 October 2011, and Svitlana Tereschenko, hit by a left-turning lorry while cycling west on 11 November 2011. The vigil was organised by the Tower Hamlets and Newham borough groups of London Cycling Campaign. Candles were lit and David Tuckwell, a local cyclist, led a minute's silence. Then the son of Brian Dorling spoke, then his widow, then the sister (I think) of Svitlana, then a local politician – I could not make out who that was, as it was hard to hear proceedings through the throng of 200 people who had turned up. 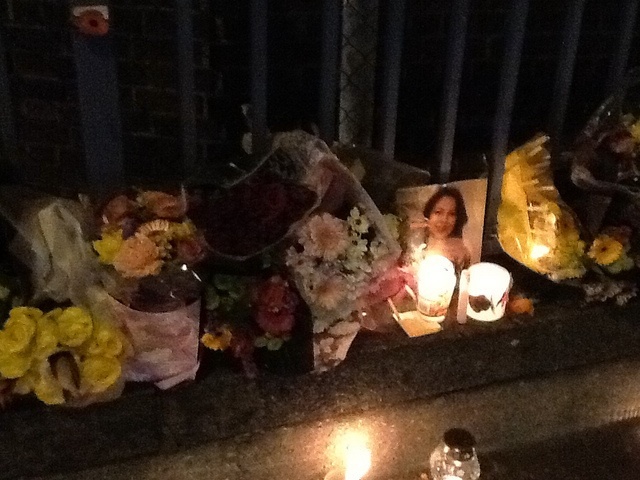 A "Ghost Bike" was set up at the NW corner of the roundabout, where Brian had been killed, while a small shrine to Svitlana was seen at the SE corner, where she died. Press, TV reporters and prominent politicians attended: Brian Paddick, Liberal Democrat candidate for Mayor (who has also been supportive of the cyclists' protests at Blackfriars), and local MP Rushanara Ali. There were many children there, including (I gather) a boy who had actually witnessed Svitlana's death. Poor boy. Another member of LCC said to me how sad it was to meet at such an occasion. But I said that I could see a good side to this. For of the 33,000 road deaths in the UK over the last 10 years, few can have attracted such attention, caused such outrage, and led to so much political pressure for change as these two. These two deaths were so similar in their circumstances, came so close together, and so soon after the opening of Cycle Superhighway 2, whose opening had been proceeded by such unambiguous warnings from campaigners about the danger of what had been provided there, so clearly against Transport for London's own consultants' recommendations, the deaths being so clearly due to the defects in the design of the Superhighway that anybody who studied it could see, so clearly due to negligent design, that public outrage was inevitable, as was more publicity than has probably ever before followed a cycle fatality on London's roads. The high-profile nature of Boris Johnson's Cycle Superhighways scheme, his personal association with cycling and with this scheme, and the nature of this specific route, being the recommended route for Londoners to use to cycle to the Olympic Park, ensured this. So now there is real pressure for change, both here and on the other Cycle Superhighways, and on London's dangerous junctions more generally. It is sad this was achieved through this succession of events, but it is the good side of this double tragedy. 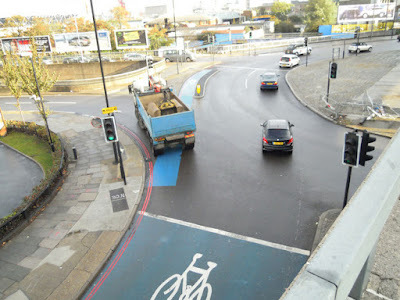 The design disaster of the Cycle Superhighway on this roundabout is clearly seen in these pictures. Large lorries and other vehicles are able, and encouraged by the design, to make a high-speed, low angle left-turn across the blue cycle lane. The potential for tragedy was always here, before the lane was painted, because of the inappropriately wide geometry of the turn and the excess lane widths. A cyclist pursuing a prudent course through this roundabout, in its pre-superhighway state, would not have been on that strip on the left, but in a more central position in the left-hand lane, to be clearer of the possibility of the left-hook and more in the line of sight of drivers. Both the blue strip and the segregated section of lane on the outer edge of the roundabout that have been provided for cyclists have clearly made a dangerous junction far worse for them. The segregated strip is the biggest error. For to aim for its narrow entrance, a cyclist is going have to take the worst possible course, the one that makes it most likely for them to be overtaken on the outside and then mown down by the inattentive driver of a left-turning lorry. The narrowness of the entrance of the segregated section and the precision of the move required to get into it will inevitably slow the cyclist, making it more likely that they will be unwittingly overtaken and ploughed into by a driver having limited visibility from his cab. This is a totally disastrous mis-application of segregated cycle engineering to a junction – one where the basic problems of the junction have not been fixed, and the best, but still highly unsatisfactory, course for a cyclist remains a high-visibility, fast, vehicular cycling approach, yet they are forced or encouraged to modify that approach to fit in with a facility that does not protect, thus creating a hugely amplified risk. Nobody who understood cycling could have designed this. TfL have been unable so far to find an immediate solution for providing controlled crossings at Bow Roundabout that doesn't push the junction over capacity and introduce significant delays to traffic. "Traffic", here, as usual when "cycling champion" Johnson uses the word, means, of course, motor vehicles. "Significant delays" to pedestrians and cyclists don't matter in the Johnson–TfL world – significant delays such as being dead for the rest of eternity. This blog is not afraid to pull its punches, and I think we should stop diplomatically hiding the personal decisions of Boris Johnson behind the acronym "TfL". The way TfL is set up, legally, makes the Mayor effectively its dictator. 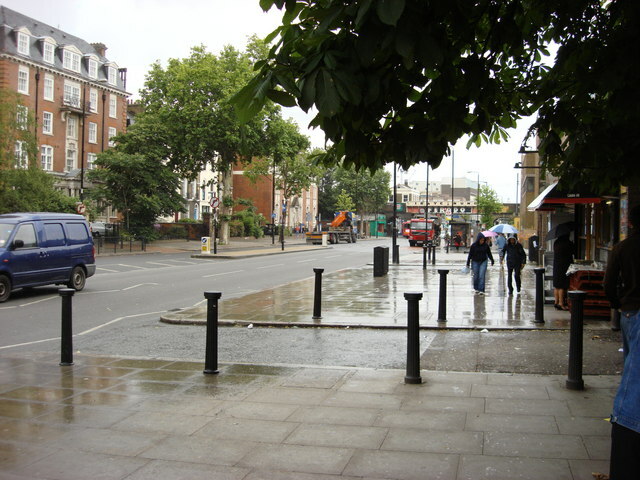 Johnson personally decided on the trade-off between delays to motor traffic and risk to cyclists at this junction, and at others like it all over London. He could have instructed TfL officials to adopt a different policy, but he did not. People have talked about "corporate manslaughter", but I am not sure there is anything particularly corporate here. If there can be said to be manslaughter connected with recent cyclist deaths at at London junctions, there is only one individual behind it. We know where the buck stops. More broadly, one should consider that if an attempt is being made to set up a safe cycling network in a city, it would make sense to take expert advice from those who have proven experience of delivering this elsewhere in the world. There is no proven experience of creating safe and effective cycle networks in the UK, thus expertise should have been drawn from abroad, ideally from the Netherlands, and officials should have been given the freedom politically to act on the that expertise. I have been saying for the last 20 years that London should get transport engineers for the Netherlands to redesign its roads, but this never happens. In every industry in the private sector these is a flow of expertise from one country to another; those who are the real experts in every field move internationally to raise standards everywhere. Whether you talk about manufacturing, engineering, banking, media, arts or sports, we do not live in a nationally-compartmentalised world. In every one of these fields the real experts operate internationally, and are called upon to go wherever they can best help and most increase productivity, quality and profits. But UK road engineering is different. It seems to exist in a bubble of its own that admits little influence or interference from people trained in places that do the same better. There are two aspects here: street engineering involves interrelated technical and political issues. The correct policies need to come from political leadership, but there needs also to be the technical expertise available to best realise the political ambitions when they are clearly crystallised. We might forget all about cyclists for a moment, and think about how to design major junctions safely for motorists. We have not a clue about this in the UK either. Standing in the centre of the Bow roundabout, it was easy to observe the designed-in chaos of the motor vehicle interactions at this intersection, with, despite the signal control, near-collisions being a constant feature, with honking of horns and sudden braking all the time showing clearly the problems created by the wrong geometry of the entrances and exits, the multiple lanes and excess lane widths. These are not problems of user behaviour. To think in this way, as Johnson seems to, is to not have progressed to a sensible, realistic understanding of the interaction of human beings with the technology of transport infrastructure. These are problems of design. The Bow intersection is a bad example, but not untypical of major UK intersections. There are many others similar in London. There are many junctions in London that frighten not just cyclists, but motorists, and are hated by many of them. I guess Bow would be one. Another that I know, because motorists in my area have mentioned to me how much they dislike it, is Northwick Park roundabout in Harrow: another chaotic, open geometry, multi-lane gyratory. This is terrifying to cycle on, and I do not do so, except to make a left-turn, and I advise cyclists to avoid it. 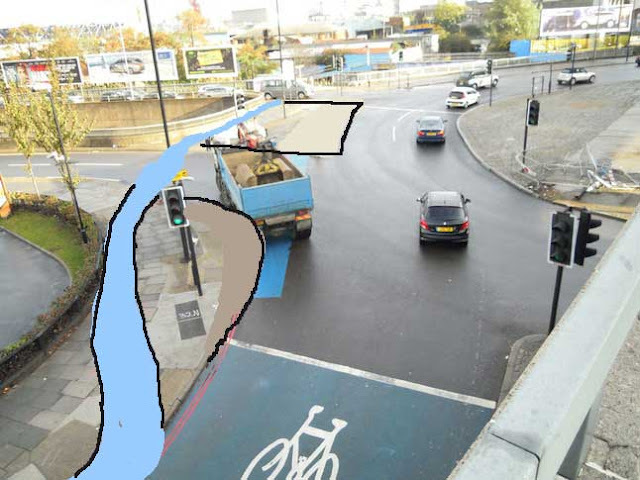 Another appalling junction that I do cycle through regularly, because, as at Bow, there is no other option for crossing a major linear barrier (the River Lea in the Bow case), is Staples Corner West. This provides the only practical way to cross the North Circular Road on the east side of Brent and the west side of Barnet. Staples Corner West is very similar to Bow Interchange. In both cases the east-west and north-south routes have both been taken across on uninterrupted separate motorway-style infrastructure. In the case of Staples Corner there are two levels of flyovers, for the A5 and the North Circular Road, over a roundabout. At Bow, the A11 is taken over the roundabout and the A12 is taken under. In both cases, slip roads connect these roads to interchange at a signalised multi-lane roundabout. In both cases, cyclists following the commuting desire-lines in and out of central London are faced with a choice of whether to take the flyover, avoiding the roundabout, but risking the low-angle, high-speed interactions with motor vehicles on the slip roads, or to go round the roundabout, risking the chaos there. Staples Corner roundabout is not quite so bad as Bow as the spaces are not so wide, but it is sufficiently bad to greatly increase my tendency to take the tube into central London rather than to cycle down the A5. There was proposed to be a Cycle Superhighway here as well, CS 11, but TfL thought better of the idea, or Barnet, which part-controls the A5 here, did not want it, so CS11 has been redirected to the A41 (where it will still not penetrate into the anti-cycling Borough of Barnet). The sources of danger at all these intersections for drivers, pedestrains and cyclists are the multi-lane gyratory arrangements which encourage switching of lanes, the excess lane widths and broad turning geometries which encourage too much speed, the lack of convenient pedestrian crossings at surface level (Staples Corner has a network of little-used elevated walkways, while Northwick Park has a pedestrian tunnel), and the obvious lack of safe cycle facilities. Homogenous use of the infrastructure is one of the Sustainable Safety requirements. On urban main road intersections, where all traffic types meet, this homogeneity requirement translates into reduction of the number of potential conflicts and lower driving speeds. 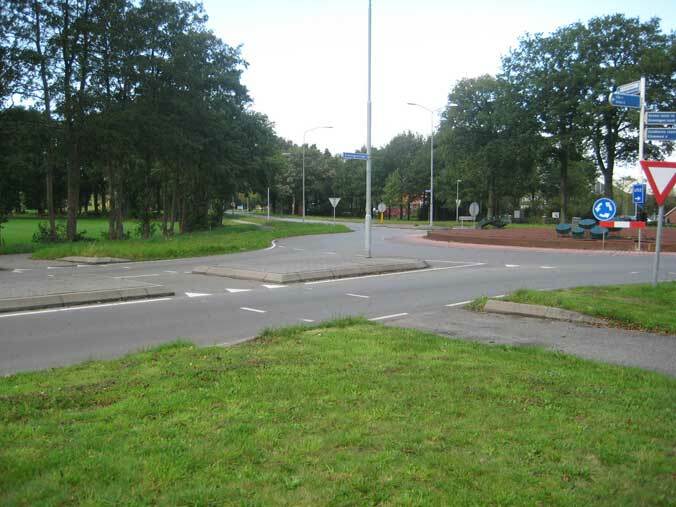 [Dutch] Roundabouts meet this requirement because of their features. By "homogeneous use" they mean all road users using the infrastructure in the same correct, predictable manner, because it was designed to make them do that. This is the reverse of the junction chaos that UK designs typically create. 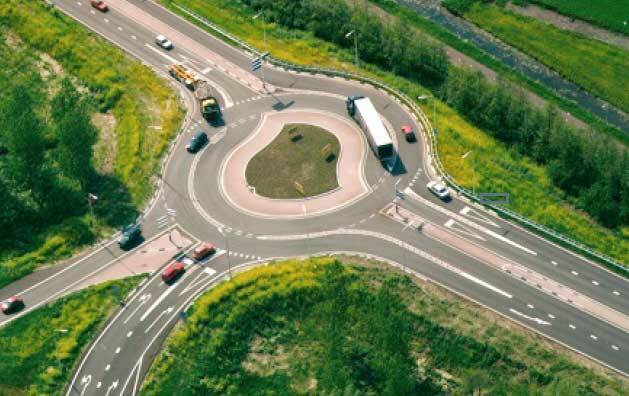 Here is a Dutch "turbo" roundabout for motor vehicles only. A separate cycle path can be seen to the top right of the picture. The roundabout is designed to satisfy the need for high capacity simultaneously with creating sustainable safety. Vehicles bound for particular destinations, having particular origins, follow fixed, predictable courses through the roundabout. There are two lanes, but no switching and no conflicts. There is only one way to go, chosen by the driver before he reaches the roundabout. 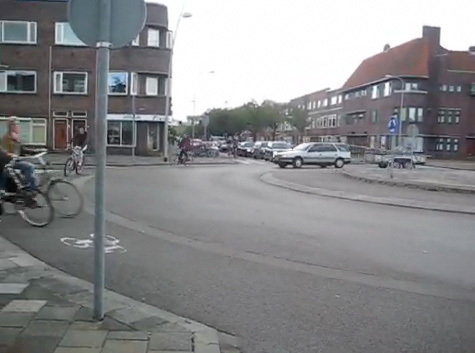 This is the simplest possible turbo roundabout, but many more Dutch roundabout designs, of increasing complexity, and including cycle facilities, can be found in this paper. 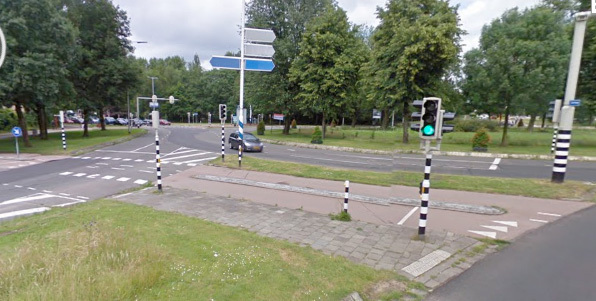 However this is not the safest nor most modern design, and the Dutch generally provide entirely separate cycle paths around their roundabouts now. This would be the case always when there is a high vehicle flow. The cycle paths cross the motor vehicle entrances and exits almost at right-angles. There are several possibilities for priority. In rural areas the Dutch usually have the give-way markings on the cycle track, but in urban areas, often the motor vehicles have to give way. 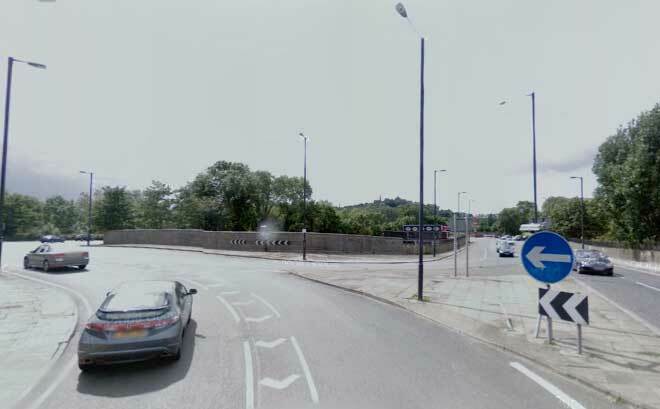 These solutions will not be satisfactory where motor vehicle flows are very high, and here signalised crossings for the cycle paths are required, so the crossing of the path with each arm of the roundabout is turned into a separate signalised junction. These signals can either be automatic, phased with other signals, or they can be push-button, or, most satisfactory for cyclists, they can be controlled by a magnetic loop detector embedded in the path which detects the presence of a bike and gives the cyclist a green as he or she approaches the crossing. 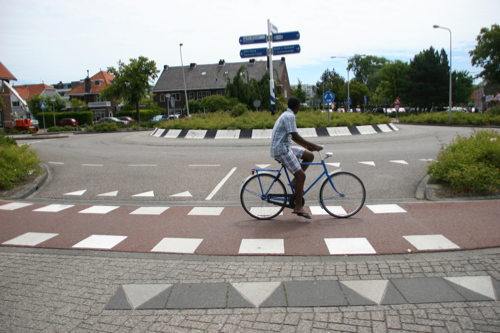 This technology is so well-established and developed in the Netherlands it is not necessary for us to dangerously experiment with cyclists on busy roundabouts in the UK. The solutions are known. David Hembrow has provided a post which shows and explains every single roundabout in Assen (there are 19 of them), showing the wide variety of designs, and the fact that they all have separate cycle paths incorporated into their design. Though I am no traffic engineer, or indeed graphic designer, I have made the crude attempt below to show how the part of the Bow roundabout on which Brian Dorling died could be modified to make it safe for eastbound cyclists, using Dutch-style engineering. This is of course not intended to be a definitive solution, but merely demonstrative of a possibility. All TfL's blue markings need to be imagined as removed. An off-road cycle track is needed to cross the entrances and exits from the A12, some way back from the point at which vehicles make their turn. The kerblines need to be altered so that the turns off the roundabout are tightened, and vehicles cross the cycle track slowly and perpendicularly. Because of the very high volume, signals are essential for the track and slip road intersections. These would allow pedestrians to cross as well. Each crossing of the track by a slip road needs to become a small signalised junction. The lights could be phased to allow cyclists fast passage across both the exit and entry slip road, stopping only once, if at all. This solution is the sort of thing that can easily be produced within existing space constraints once throughput of motor vehicles ceases to be the over-riding criterion. 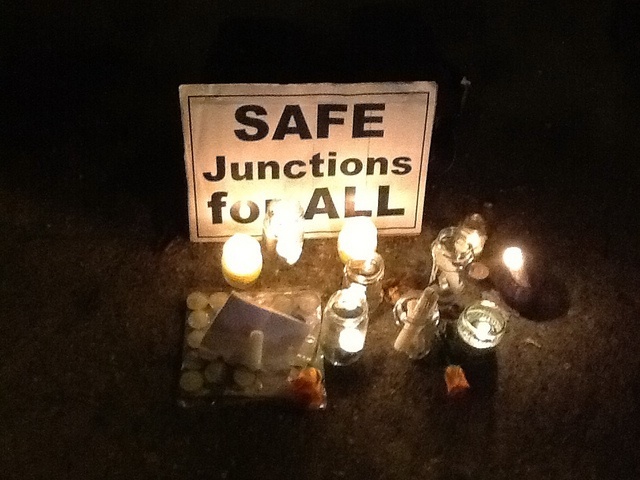 Motor occupants benefit too from a safer, calmer, more predictable junction. 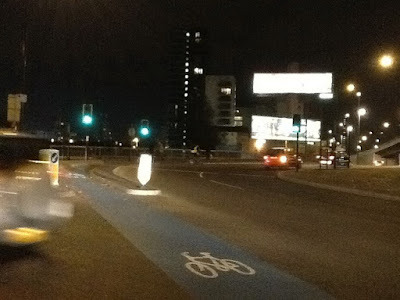 Fixing the Bow roundabout would not fix Cycle Superhighway 2, which I cycled on my way back from the vigil on Friday. The rest of it is a travesty of safe cycle infrastructure as well. The blue lane, marked intermittently in the inner half of the bus lane, does nothing to remove conflicts between cyclists and buses and conflicts at other junctions. This lane has no legal force, not being a mandatory cycle lane (not bounded by a white line), and it gives cyclists no protection in law, nor in practice. The A11 is a horrible road with a peculiarly aggressive "Gotham City" feel to it as you cycle towards the huge, overbearing towers of mammon of the City of London, looming up ahead. The implementation of this Superhighway, of all of them, was uniquely disappointing, as the space for creating proper, segregated cycle tracks on both sides of this road was so clearly present, even without alteration of the current vehicle lanes. The road is enormously wide, with much unused pavement space. Bow Road, the A11, photo by Oxyman, taken before the implementation of the Superhighway. Plenty of space here for a wide segregated cycle track. Basically, the Superhighway here, as with all of them, was done quickly, on the cheap, and with no coherent thinking on what it was actually supposed to do, save for waymarking a route which was obvious anyway: it is, after all, just the main road, the one that anybody cycling from the City to Stratford has to follow. Cycle Superhighways does not have the time or the budget to... seek major changes to traffic operations (e.g. via side road orders or controversial Traffic Regulation Orders). 1. 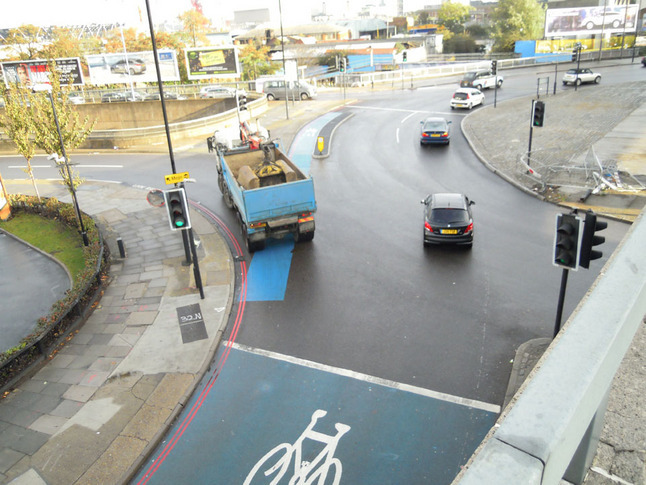 Call upon TfL to immediately redesign the Bow roundabout junction, providing continuous, safe East-West cycle crossings and safe approaches and exits. 2. Call upon TfL to halt work on the remaining Superhighway routes until issues of road space reallocation and junction danger are addressed and resolved. 3. Call upon the Mayor to intervene and give TfL the mandate and political direction to provide clear space for safe cycling on London's main roads. 4. As part of out "Go Dutch" campaign, seek a commitment from the mayoral candidates that the Cycle Superhighways will be completed (including resolving barriers on existing routes) to the highest international best practice standards, in accordance with LCC's "Go Dutch – Key Principles" document. Work is beginning on how London gears up to move to the next level of cycling infrastructure and continuing to improve safety for cyclists. This includes a commitment from TfL to review all major schemes planned on TfL roads as well as to review all the junctions on the existing cycle superhighways. That work will include an assessment of Bow Roundabout, which TfL have been asked to report back to the mayor on as a matter of urgency. This could be interpreted as progress, but it could be intepreted as fobbing-off. We have had reviews and studies of cycling in London until our eyes fall out. What we need is not more reviews by TfL, but a change in policy by Boris Johnson, away from putting motor vehicle throughput above safety for all road-users. If these reviews are a face-saving way of him making this change, that is good. But I worry that what will come out of this will be some nonsense such as merely moving the blue lane at Bow roundabout from the outside to the middle of the carriageway. "The next level of cycling infrastructure" sounds fascinating. Is this the level where cyclists only get their limbs crushed under lorries, as opposed to their heads? For I believe that is what actually happened to both the victims of Bow. I, for one, would like to see Boris Johnson apologise personally to the relatives of Brian Dorling and Svitlana Tereschenko, and personally promise to them to start to mend London's deadly junctions, in Brian and Lana's memory. I end with a video I made of the one minute's silence on Friday. As far as I'm aware, there have been no fatalities amongst cyclists involving bendy buses on London's roads. The Cycle Superhighways project appears to "wipe out" cyclists all the time - is it time to hold a competition to get rid of them? On the subject of corporate manslaughter, an article on the BBC caught my eye. I don’t want to seem to be trying to score points from what is obviously a horrific tragedy, but if Network Rail can be prosecuted under these circumstances then surely TFL can be for the design a Bow Roundabout or Kings Cross? If Network Rail can be prosecuted, let alone convicted, for the deaths when it is reported that the poor girls ignored multiple warning systems and failed to “keep their wits about them”, then how can any pedestrian or cyclist death not be blamed partially on the highways department responsible? The fact that this case seems to revolve around Network Rail ignoring a safety report makes it strikingly similar to Bow Roundabout or Kings Cross. Of course, unlike the driver of a road vehicle, the train driver cannot be blamed in any way, leading us to look elsewhere. However, the drivers of road vehicles are held blameless in many collisions with vulnerable road users also, suggesting that in a similar fashion, the blame must rest with the highways department, if there is to be any consistency here. Go and have breakfast at the Three Mills Cafe and observe the traffic - something that TfL and Jacobs engineers might have been advised to do when planning this dreadful scheme. You might notice that the bulk of the motorised traffic is heading down to the roundabout, as it does on the other side as well, and it turns left or right via the roundabout on to the A102/A102(M) - now there's a clue about traffic speeds in that (50mph) as well as the likely benefit to a cyclist of going via the roundabout. Look at the flyover - Westbound one of the 2 lanes is permanently closed off, and during the Olympics there was just one lane Eastbound as well. You won't see that many cars going over the flyover either but at least 70% of the cyclists ARE using the flyover. Sometimes you might even get a photo with no cars in it - just bikes going over the top. They are smart cyclists. 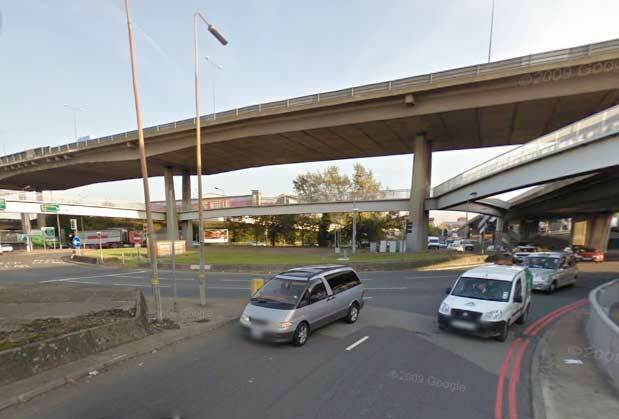 No driver (well no sane driver) is going to make a left turn over the edge of the flyover - effectively eliminating that hazard, which quite bluntly no arrangement of delayed lights and contrived alignments of cycle path is ever going to eliminate completely. The whole traffic management arrangements at Bow are to put it politely a canard. Both slip roads on the east side carry 2-way traffic with a series of cut-through connections to get various vehicle movements accommodated, and regular illegal use of these cut-throughs to jump the queuing traffic. At the NE corner there are traffic signals to let traffic out to get on to the slip road which rather helpfully regulate the traffic on the nearside for a cyclist coming over the flyover. On the SE corner the contra-flow traffic turns right through the queue with the inherent hazard of coming through a stationary line of motor vehicles and driving square on across the cycle route without any warning or decent sightlines. The solution is that given the major cycle flow is East-West, and there is also a massive need for pedestrian connectivity, to close the outer lanes on the flyover and create a route with a footway and cycle lane on both sides with crossing points at the corners where the flyover lands. North-south traffic is catered for by the Lea Navigation towpath that passes directly beneath the junction and the connectivity from local streets to the East and West. With a bit more investment the route over the flyover could come off at the upper level and cross over the slip roads, coming down on ramps outside the slip roads, but the quicker fix would be to provide light controlled crossings of the slip roads for pedestrians and those who lack the speed or confidence to filter across and on to/off of the flyover with the motor traffic. "new island would be shared by pedestrians and cyclists to enable cyclists to cross Stratford High Street to access the towpath"
No mention of making the 'stop twice' facility into a real 'early start' !